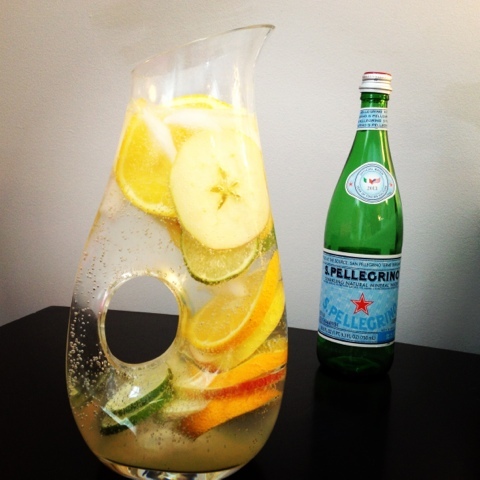 Today we are making a pitcher of our sparkling sangria inspired water. This is the perfect bubbly, refreshing treat to sip all summer long as it's simply made from sparkling water (we LOVE Pellegrino! ), fresh cut apples, orange segments and fresh lime slices. This is one of our favorite mocktails as we do not like to drink our calories! We will choose fresh fruit infused water over a sugary, artificially & chemically sweetened can of cancer anyday. This looks amazing...perfect for the summer!!! This looks so very refreshing. I will have to try combining these fruits along with sparkling water. Yummy, what a great idea. This looks so refreshing, and well I'm really thirsty so it looks absolutely fantastic. Hope you have a great day.